Make-Your-Own Mighty Morphin Power Rangers Available Now | Nerd Much? In anticipation of Lionsgate’s Power Rangers reboot film releasing March 24, Build-A-Bear and Saban Brands are offering the new Make-Your-Own Morphin Power line. 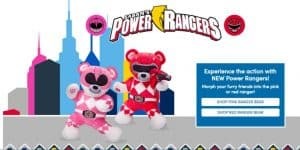 According to the company themselves, “this launch marks the first time Power Rangers furry friends and accessories have been offered at Build-A-Bear Workshop.” Unlike ever before, you can now bring your kids in, and they can custom design their own awesome Power Ranger. One such feature being that you can “add the Power Rangers theme song to your new furry friend!” The collection will be available at BuildaBear.com, BuildaBear.Co.Uk and in the US, Canada and U.K. Build-A-Bear Workshop Stores. Not only can you purchase the two pink and red Power Rangers pictures here, Build-A-Bear is also “releasing a line of costumes, accessories and a sound chip, all based on the original hit TV series, Mighty Morphin Power Rangers.” What even more cool, is that if you visit one of the Build-A-Bear locations in the US or Canada between the dates March 24-26, you will receive a fancy Power Rangers paper mask. Nothing like free stuff to make a day better, to be sure. If you’d like to shop the entire collection right now, feel free to visit their site and check out other sweet online content. These include a wide selection of coloring pages and online games for your kids to play. Will you be taking your kids in to get a super cool Power Ranger bear? Let us know in the comments below!